More than six decades after a certain radio show first hit the airwaves to signal the forerunner of the modern sitcom, the genius that was Tony Hancock is still packing a punch today. His self-styled Hancock's Half Hour radio show ran on the then BBC Light Programme for half a dozen series from 1954 to 1961, later making the switch to television, and in so doing also made stars of fellow comedy legends such as Sid James, Kenneth Williams and Hattie Jacques. 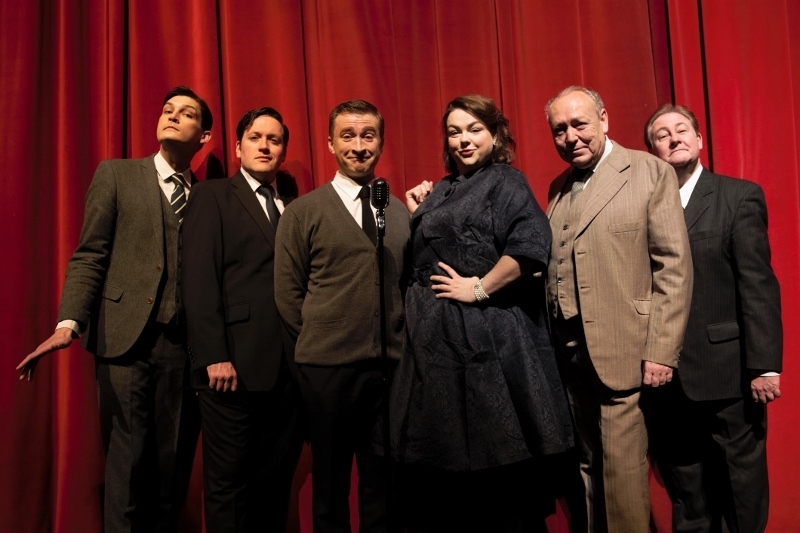 Happily for fans of 'the lad himself', Hancock and his entourage are currently enjoying a welcome revival in the form of a new live stage show which I got to see at the Lichfield Garrick theatre on Saturday 16 March. 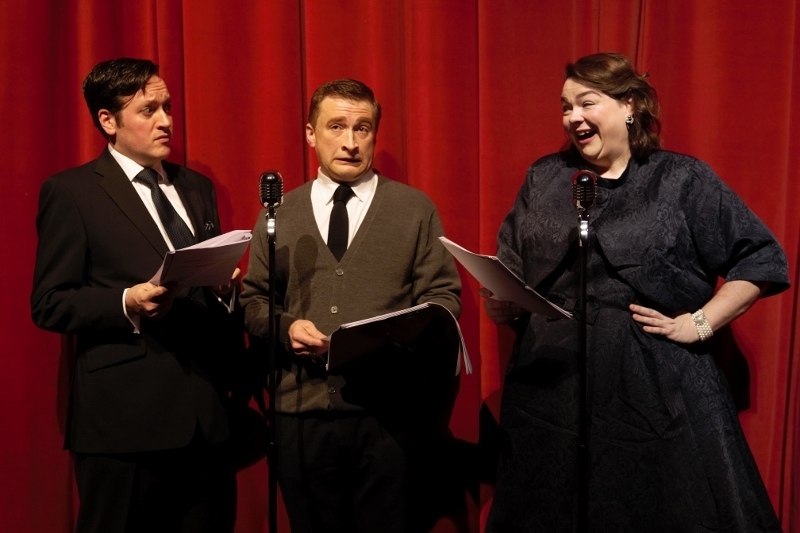 Hancock's Half Hour, produced by Apollo Theatre Company - who have already given us stage shows of other classic radio comedies, The Goon Show and Round the Horne - is a delightful and suitably funny tribute to Tony Hancock to mark the 50th anniversary of his tragic death. This stage production, expertly produced and directed by Tim Astley, recreates three episodes from Hancock's classic radio show, written by the up and coming Ray Galton and Alan Simpson in which the Birmingham comedian plays a less successful version of himself. Dead Ringers impressionist James Hurn is superbly cast as Tony Hancock as the star turn in each of the three radio show episodes performed at the Lichfield Garrick. He is aided by a splendid bunch of actors as Hancock's fictional home, 23 Railway Cuttings, East Cheam, comes to life on stage. Particularly impressive, again, was Colin Elmer who reprises his role from Round the Horne as Kenneth Williams, while fellow comedy greats Sid James and Hattie Jacques are also well portrayed by Ben Craze and Laura Crowhurst, the latter of whom starred on her previous Garrick appearance in Crimes of the Christmas Pudding last December. 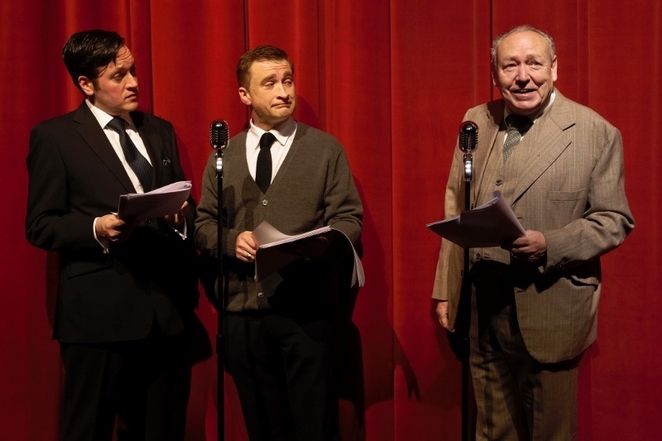 The excellent cast is completed by Tom Capper as Australian comic Bill Kerr, who plays Hancock's live in lodger in the radio shows, and Clive Greenwood who provides the BBC announcements and sound effects. Clive also appears as the doctor in the evening's 'bonus', a short excerpt from Hancock's classic blood donor sketch in which he delivers the immortal line "a pint, that's nearly an armful". 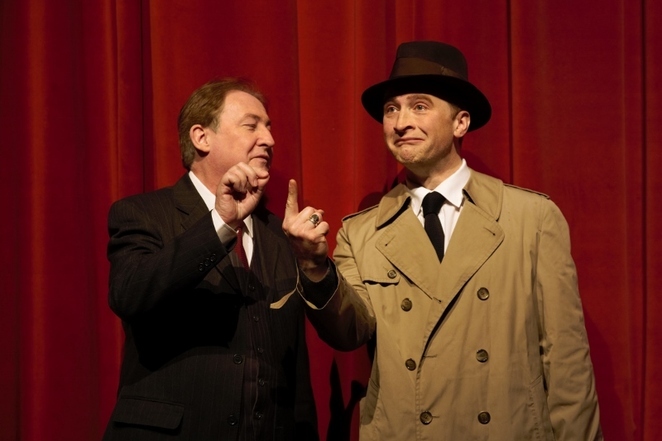 The Hancock's Half Hour episodes performed as part of the stage show are "Hancock in the Police", "The Americans Hit Town", and a particularly hilarious "The Wild Man of the Woods". In all three episodes, Sid James is portrayed as a crook and a rogue, Hattie Jacques appears as Hancock's secretary Miss Griselda Pugh, while Kenneth Williams takes on a variety of entertaining roles from a police sergeant and US army colonel to an inspector from the Ministry of Housing.